The Reverend F.D. Reese accepts the Congressional Gold Medal from Speaker Paul Ryan. 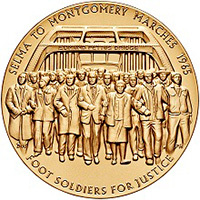 The Congressional Gold Medal was presented collectively to the voting rights marchers who participated in the Selma to Montgomery, Alabama, voting rights marches of 1965 on Feb 24 during a ceremony in Emancipation Hall in the U.S. Capitol Visitor Center. March 7, 2015, marked the 50th anniversary of these peaceful marches by civil rights demonstrators from all racial and economic backgrounds — known as foot soldiers — to protest the denial of voting rights to African-Americans. The first march, which left the Brown Chapel African Methodist Episcopal Church in an attempt to cross the Edmund Pettus Bridge, was unsuccessful. The day became known as Bloody Sunday because of the brutal resistance the protestors encountered. The second attempt to cross the bridge, known as Turnaround Tuesday, was halted because of concern for the protestors’ safety. Undeterred, the protestors attempted a third march from Selma to Montgomery which was successful, becoming a climactic event in the civil rights movement. The extraordinary bravery and sacrifice of these men and women brought national attention to the struggle for equal voting rights and served as the catalyst for Congress to pass the Voting Rights Act of 1965, which President Lyndon Johnson signed into law on August 6, 1965. Many of the original foot soldiers were in attendance at the ceremony where several members of congress praised their courageous efforts that ultimately led to African Americans having the right to vote. 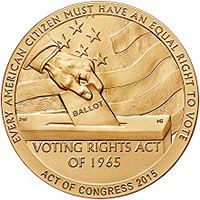 Speaker of the House Paul Ryan along with Senators Harry Reid, Mitch McConnell and Representative Nancy Pelosi presented the Congressional Gold Medal to Representative John Lewis and Reverend Dr. Frederick Douglass Reese. Watch the full ceremony.